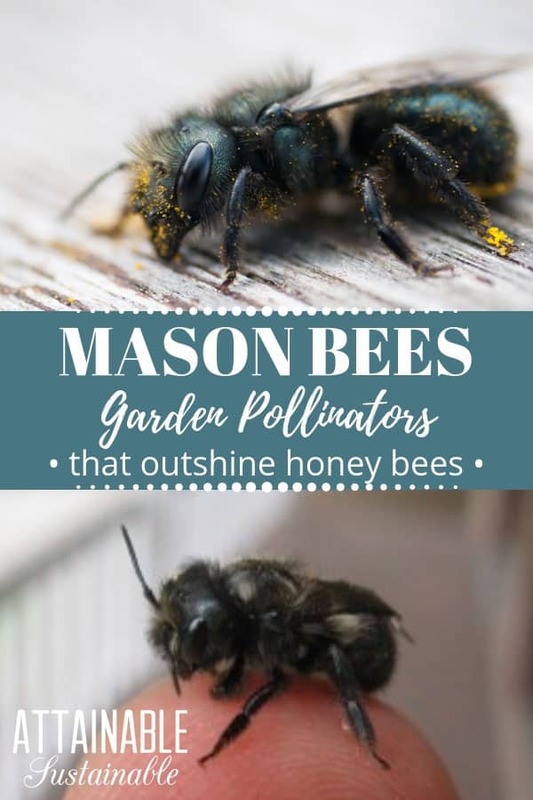 Everyone knows about honey bees, but it’s time we got to know some of their native counterparts, specifically, mason bees. Demarus Sandlin from Crown Bees offered to share some common misconceptions in an attempt to encourage gardeners to expand their idea of pollinators to include more than the familiar honey bee. 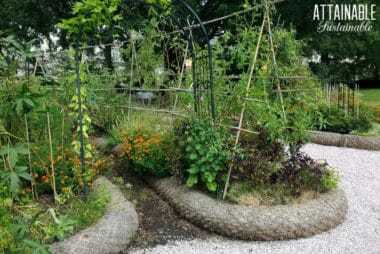 She also talks about how to attract mason bees to your garden. 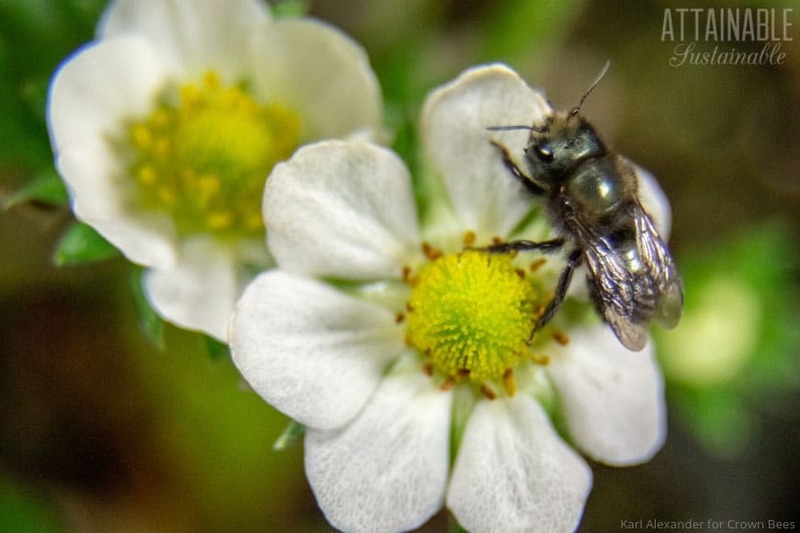 Mason bees are a bee species you might not recognize, but they are great pollinators. Here’s a look at how native bees differ from our misconceptions. In this case, Demarus introduces us to blue orchard mason bees, Osmia lignaria. Honey bees are actually not the greatest pollinators. When this bee species gathers pollen, they wet it and form packages on their hind legs. Not much pollen falls off these wet pollen packs. Mason bees carry pollen in dry form all over their hairy bodies – these messy little flyers pollinate essentially every flower they visit. They are an efficient pollinator and just one is equal to about 100 honey bees as far as pollination goes. Over the last 60 years, honey bees have been used as agricultural pollinators but a more sustainable practice is to support our native pollinators. How to attract mason bees: Provide pollen. 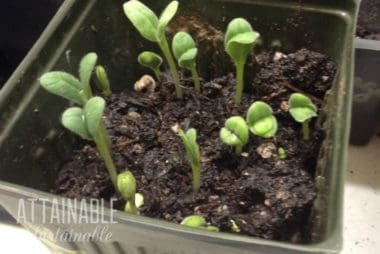 If you want mason bees to help pollinate your vegetables, one of the best things you can do is to provide flowering plants that will attract them to your garden. Most solitary bees are not aggressive. Male mason bees do not even have stingers. Females do have stingers, but are usually busy gathering pollen and nectar for their own eggs. 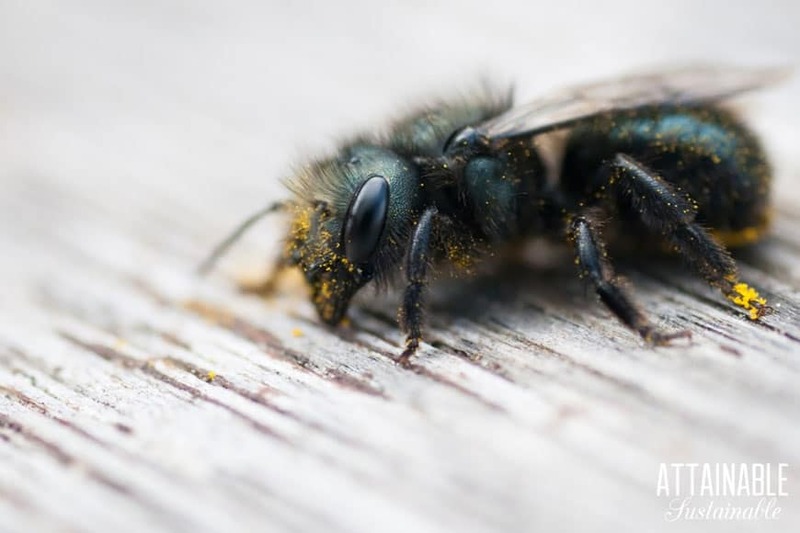 If a female mason bee does sting, it will feel similar to a mosquito bite. Of the 20,000 species of bee in the world, only seven are honey-producing. 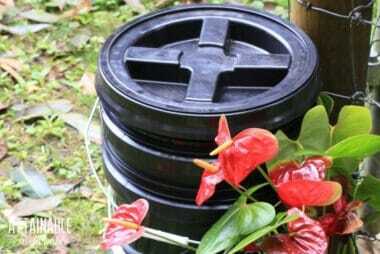 Bumblebees make small nectar stores but they are small pots for use during brooding season. Masons do not make honey; instead they gather pollen and nectar to feed their young. The pollen is gathered into a pea-sized ball and mixed with nectar to form a pollen loaf. An egg is laid on this loaf and the hatched larvae feed on the mixture. Only 10% of the world bee population builds hives and supports one queen bee. Ninety percent of the native bee population are solitary, meaning that each female is a fertile queen and works hard to lay eggs AND build nests. About 70% of native bees are ground-dwellers and around 20% live in cavities or holes. The Mason bee variety lives in holes like hollow reeds. Although they are not social, they are gregarious, which means they do not mind living near other bees. A stack of nesting holes acts much like an apartment building, and each female “owns” the hole she nests within. 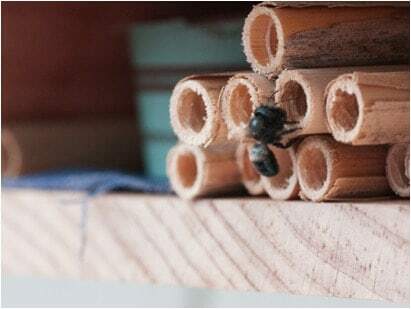 You can attract mason bees and encourage them to move in by providing suitable nesting space. Mason bees are not the same as Carpenter bees. Mason bees nest in ready-made holes. Carpenter bees, on the other hand, drill holes in wood. Trees, two-by-fours, decks, house siding, you name it. They prefer untreated wood, but in a pinch, they’ll even carve holes in finished wood. Carpenter bees make these holes for laying eggs, but their work can do damage. Mason bees are not the ones to blame for damaged wood. While this may be true for honey bees that will fly up to four miles in search of nectar and pollen, most natives stay very close to their nesting sites. Masons will only travel up to 300 feet, or 100 meters, away from their nesting holes. 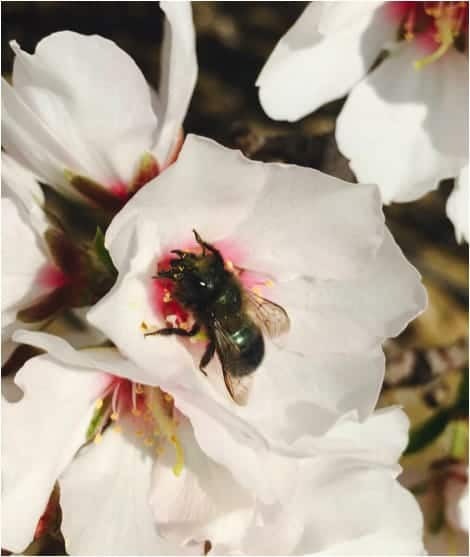 Mason bees love early-blooming spring trees like apples and cherries. The name mason bee comes from the bee’s nest-building behavior. The female mason bee carries clay-like mud in her jaws and uses it to build chamber walls. Provide a water source. And don’t be too tidy with it. (Ducks can help with this!) 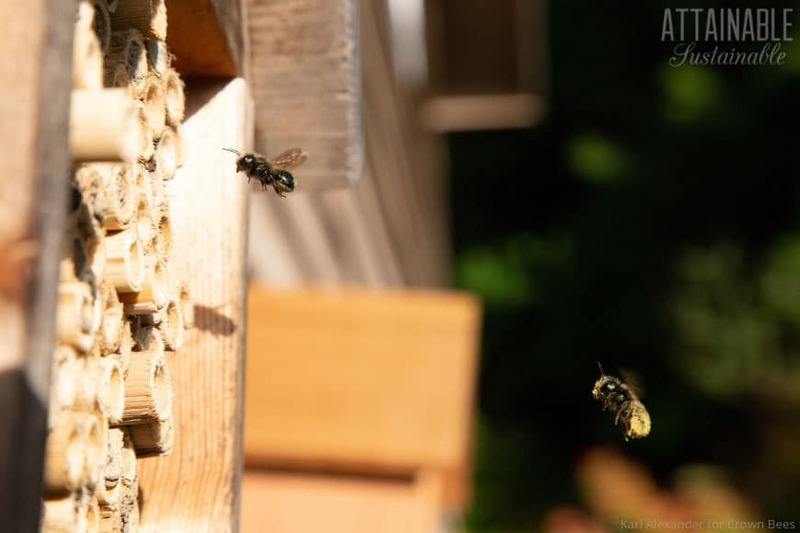 Mason bees will appreciate the ready source of building materials. To learn more about this gentle, safe, and easy-to-raise bee species, please visit Crown Bees here. I live in central lower pennensula Michigan. We are just getting out in our gardens. Perrenials are up about 3 inches. Over the last 3 or 4 days I have noticed a bunch, 30 or so, bees flying just above the ground in one small area of my garden. There seems to be one that is slightly larger than the rest. The smaller ones seem to lite on the larger one and there seems to be no aggression towards one another or to me when I am near by. I was watering the garden with a soft spray and went over them and they moved away but we’re back the next time I looked. What is this behavior? What kind of bees? What should I do? About 70% of our native bees nest in the ground. If the bees you see are solitary they are nesting next to each other and they don’t mind sharing the area. Can you see multiple holes or just one hole in the ground? Their non-aggressive behavior makes me think they are solitary, native bees. Male bees are usually smaller than females. There are also fascinating bees that are cuckoo bees that hoover over ground-nesting bee’s homes, looking for the chance to sneak in and lay their eggs on the other bee’s provisions. Ground bees are a great marker of your yard’s friendliness to insects of all kinds! Fortunately, many of the blooming plants that benefit honeybees will help native pollinators as well. True individual honeybees do not move as much pollen as some native bees. However, dry pollen attaches to their “hairy little selves” and it spread from flower to flower. Honeybees are valued because they live in large colonies. Most native pollinators are less numerous in any given area. All pollinators are important. I live in NE WA I have had honey bees placed on my farm for years but the last 5 yrs the bee keeper ships his bees to CA for the winter and they don’t make it back till after my orchard is finished blooming. So 4yrs ago I started building and placing mason bee houses in and around the orchard. I sure noticed the different in the amount of fruit I receive each year. Have 2 new houses to hang this year because all the tubes from last year are full. The orchard is abuzz in early spring when the cherry trees bloom up to the time the apples come on. My dad had several hives of really gentle dumb bees. Then these africanized bees came up that are truly aggressive and mated with them. Then they would bump into you and get mad at you for bumping into you and chase you all around the yard. Ha ha. Dad told me he never got stung. But then I was talking to one of his coworkers and he said Daddy got stung all the time. Well Dad had to work with the hives…put on his hat and face net and use his smoke puffer to calm them down before going into the hives. Daddy said the stings were actually good for his arthritis. Thank you for an interesting and informative article. Hopefully most of this info also applies to the UK. 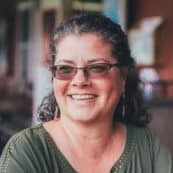 Loved this article’s! I think bees are so interesting.